Far too often, we hide behind masks of status, role, function. Sometimes power. But every now and then, a bit of our humanity slips from behind these masks. Every now and then, the masks fall, we get to peer in, and see the real human beings behind. I got pulled over by a cop car on the hike/bike trail last night. Yep. You heard me right. And, strangely, that’s what got me thinking about all this. I was a mere 200 yards from my car when it happened. I could literally see it in front of me; when, lo, I looked behind to see a cop car, lights flashing, driving up the trail behind me and my ten speed. My first thought: I’m gonna get a ticket. They’re all paid off now. (Yes, I paid three years of those state fees, before the Legislature did away with them. It was, literally thousands of dollars…) It changed me. I’m a much more careful/mindful driver now. Or, I try to be. So, as I look behind at the cop car closing in, I have a sinking feeling: I’m going to be the only human being ever ticketed by a cop car on the bike trail. Dennise is gonna kill me, die laughing, or both. Got to the last 1/4 mile, at the LBJ Freeway underpass. As many here in Dallas will know, LBJ is being widened, and there are closings up and down this stretch all the time. 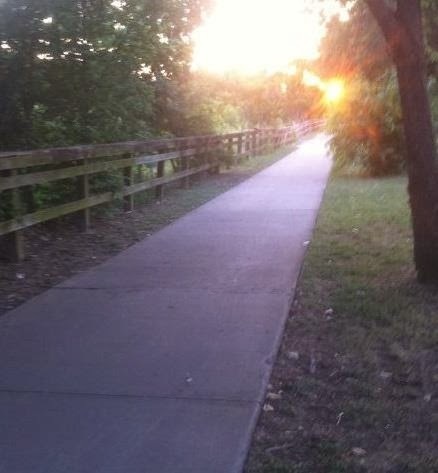 The trail crosses under LBJ right at Park Central (across from Watermark Church). So, I hopped off the trail and onto the road, crossed under, and headed for the last few feet of the trip. What I know now is that they were getting ready for all-night construction. Probably moments after this encounter, there were workers all over the place, and the street was probably blocked off too. I got to the other side, and there was a barrier across the trail. That probably should been a sign to stop. But, as I said, I had less than 1/4 mile to go. Around a tree-lined curve, and one final footbridge, there’s Valley View Park, and the parking lot with my car. But! Just beyond this final little bridge, was another cop car; this one sitting on the trail, faced the way I was riding, blocking traffic from coming toward me. Uh oh, I thought. But I drove around it, hopefully. An instant later, the lights were flashing, the car’s driving up the bike trail toward me. Pulled over by a cop car on the bike trail. That’s a good enough story to share with you here. But here’s where things actually got interesting. I knew I was dead to rights. I know what cops are like. You do too, right? At the very least, I was about to get lectured. Sure enough, the cop got out, stereotype to the “T.” Reflective shades. Short-cropped blond hair. Crisp, black uniform, with lots of impressive looking medals. At this point, he appears to be out of questions. But then, he asks one more. One that, in my case, has been known to shift many a conversations. “So, what do you do for living?” he said. And at this point –as any of your clergy friends will no doubt tell you has happened them– his entire demeanor shifted. “I guess you’re the one usually doing the sermons,” he noted, a bit sheepishly. We both laughed. He gave me back my license. He told me to be careful and to try to listen more. But I have now. he was talking about this horrible story in our local news this week. And at this, he looked as if he was about to break down. The cop said these words, as if he was trying to wash something off himself too. Through all of this, he literally looked like he might break down at any moment. And, of course, as the father of a daughter, I felt it too. He nodded, almost imperceptibly. Thanked me. We shook hands. And I went on my way. I tell this story, recognizing that, for better or worse, most folks wouldn’t have gotten the “pass” he gave me. That is true. But, then, he wouldn’t have opened up to most people like he did either. It ended up being a pretty nice moment, and in the end I felt a flood of compassion for him. And, like I said at the start, the whole encounter has got me thinking of how how often certain respect, authority, and behavior is dictated simply by how we perceive the “role” of the person we’re talking to. A cop –with his badge and uniform– begins the traditional cop “bluster,” almost like a rote speech. But how many ministers do that too? Tons. They just parrot things back, with no feeling or connection. How many times do we clergy hide behind our roles, and either not seek, nor find, a real human connection with others? Of course, I wonder if I’d said, “I’m a singer-songwriter,” what reaction that would have evoked in him. Who knows? Maybe he plays bass in his spare time. What I know is, that just saying the words “I’m a United Methodist Minister,” suddenly changed me from a sweaty, goatee wearing, law-breaking cyclist; and into someone he felt a need to share with. I’m still the same guy, the moment before I say those words to him, but he doesn’t know that because he doesn’t know me. And, in truth, he still doesn’t know me the moment after I say it either. Heck, I could be lying for all he knows. But he grants me a kind of emotional openness into his life, just based on my title; in much the same way people grant him certain authority/respect, just because of the badge/uniform. He made the choice to see me differently. And, I suppose I did too. I no longer feared another ticket. I no longer just heard the rote bluster of badge and uniform. The moment he shared that his day began by seeing a raped 17-year-old girl, the moment I saw that lump of real emotion? I suddenly saw a pained human being, with far too few places to put it all. Just like all the rest of us, really. We’re all out here, trying to have human experiences with others. Tender and honest ones, if we feel safe enough. We’re all out here, trying to have that same kind of connection with others, but, far too often, getting tripped up by the stereotypes. (1) I’m guessing I’ll never see it again. (2) BTW, the vast majority of these tickets were going to/from the North Texas Annual Conference over several years. I freely allow you to psychoanalyze this and come to any conclusion you wish.